A special edition “Royal Princess Sparkle” doll was also issued. 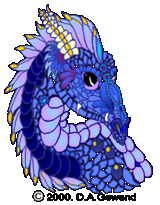 But this version came with a very elaborate white and purple outfit. She had holographic wings encased in plastic, when viewed thru the special wand that was provided with the doll one could see the stunning rainbow colors in the wings! 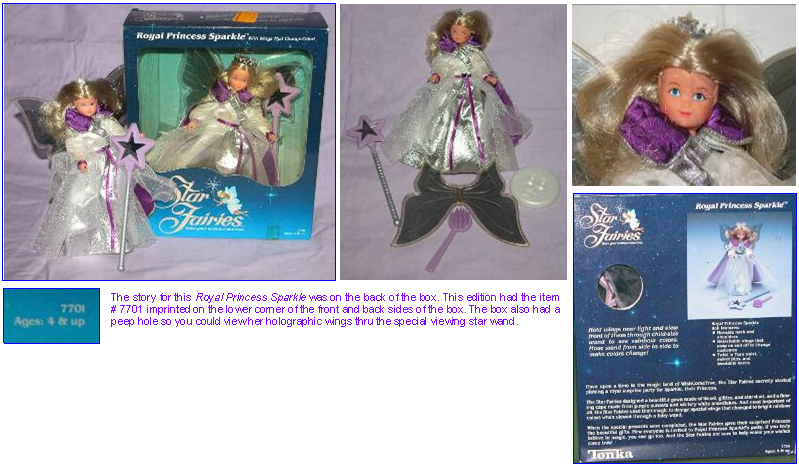 She came with the standard white posing stand, purple hair brush, royal silver princess crown, a special child-sized hand wand and holographic wings. 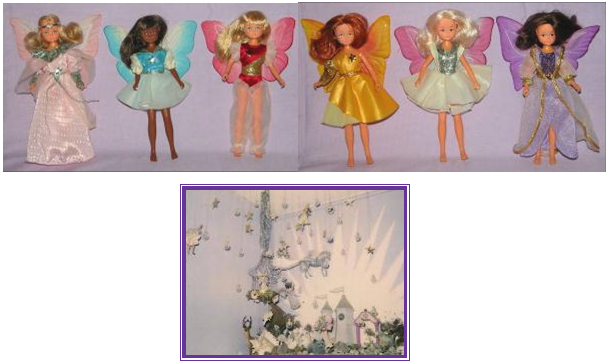 A bedroom corner wall, fantasy display featuring a “Star Fairies” living mobile. Fairies were hung from ceiling via thread looped to the backs where wings snapped into body. Heavier items like “Lavender & Star Coach” were hung with a heavy duty carpet thread. Display also had hanging golden stars and iridescent glass bubbles (globes). “Castle WishStar” was surrounded with “Animal Friends” sea-shells and pretty rocks. 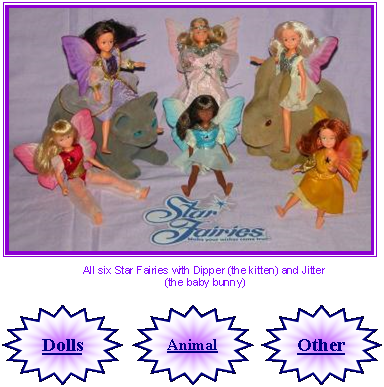 Disclaimer: All pictures shown were taken from my private collection of “Star Fairies”. The stories provided with descriptions are from the actual original packages and are displayed here for those who have never had the opportunity to see these toys and read the lovely stories. 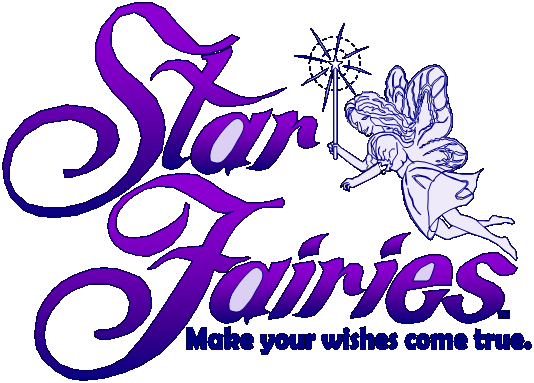 Information provided is intended to be a guide for those who are searching for historical information on the “Star Fairies” series made by Tonka Toys. If you are looking for current market values for any of these items, check E-bay. Like all other toys, since these items are no longer manufactured the going rate may be whatever the current seller is willing to sell these toys for, and likewise whatever a current buyer is willing to spend.